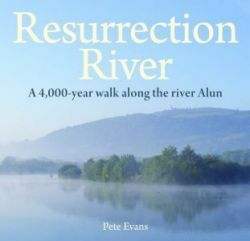 A 4,000-year walk along the river Alun, an esoteric river full of many tales and secrets. It is a river of tranquillity and droughts, floods and trade, where fortunes were made and lost, and this book follows, on foot, the river through landscape and time, through farmlands and past-industrial mining areas, disappearing underground only to resurrect again. Further Information: The Alun in north-eastern Wales is a river of tranquillity, of droughts, floods and trade; fortunes made and lost. At times it doesn’t exist at all and yet at the same time it is two rivers. This book follows – on foot – the Alun through landscape and time, through farmlands and past-industrial mining areas, disappearing underground only to resurrect again. At Mold, her largest town, the author enjoys the work of her creative sons before delving in the conflicts of her past – castles, coal mining and dykes. The Alun is an esoteric river and the journey along its length reveals her many tales and secrets.